Watch his speech introducing the Senator at a rally in Miami. Pusha T has been vocal in his support for Hillary Clinton, reportedly FaceTiming with her and also selling Delete Your Account t-shirts. On Saturday, October 15, he took things a step further and introduced his fellow Virginian Tim Kaine at a Miami rally. 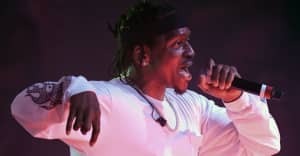 Check out Pusha T's speech below.